I'm so excited to introduce to you Grosgrain's newest sponsor Dingbat Press! I love all things elegant and pretty! So I've always had an affinity for letterpress! It gives your stationary, business cards and invitations that extra POP that sets it apart from ordinary paper. 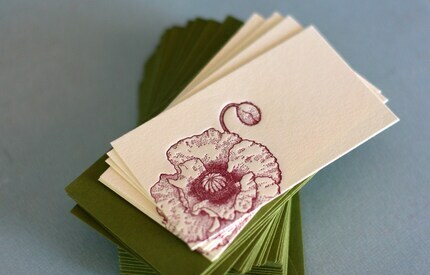 Specializing in distinctive, hand-pressed letterpress stationery, Dingbat Press utilizes knowledge of printing, design & aesthetic to create a unique stationery set for every client. All paper, envelopes and inks are specially coordinated for each design Dingbat Press creates. Visit her blog for her latest creations and updates! Check out all the new product Dingbat Press has to offer! In addition to their wedding stationery, they've expanded their collection to include baby, personal, correspondence, holiday, imprintables and a few surprises on the side! Her collection is open to retailers so if you are interested let her know! surpassed by cheaper methods, better suited to mass market and fast production schedules. However, just as Van Gogh is admired in a world of paint-by-numbers, fine letterpress printing is increasingly regarded as printing at its finest. The letterpress process is relief printed. This occurs when a raised surface is inked and pressed into paper. A raised surface can be wood type, metal type, a dingbat (typographic ornament), a photo-engraved plate, a woodcut, or a hand-carved linoleum block. The application of modern technology to the initial letterpress process creates limitless design possibilities for your stationery, while still maintaining the fine art tradition of hand printed papers. 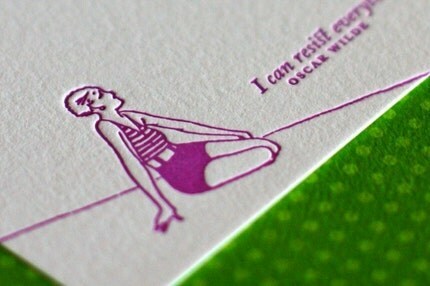 In fine letterpress printing, the object of print is to obtain a precise and sharp impression. The quality of the impression should reflect a visual and tactile aesthetic within the paper. Depending on paper selection, an impression can reflect either a subtle imprint, or a crisp bite. Ultimately, the impression leaves behind a history of the process, indicating the quality of the print. 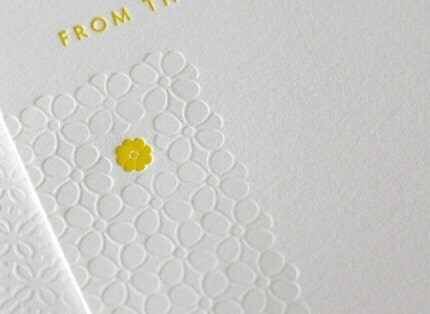 In the end, every letterpress print holds a mark of character in its making. How pretty! 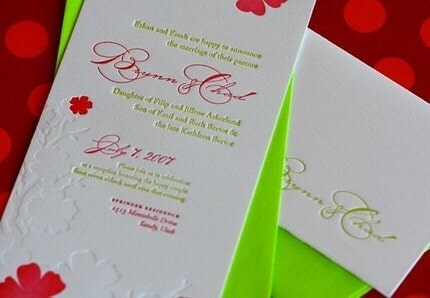 Wedding invites in color would be pretty! love the one with the Oscar Wilde quote. Ooh. I love those papers.